Sustainability performances of colleges and universities are measured by the Association for the Advancement of Sustainability in Higher Education (AASHE). We are also a member of the College & University Recycling Council as well as an EPA Green Power Partner. Saint Mary's College first submitted a report in August 2014, earning a Bronze rating. You can learn more about our past sustainability efforts and results here. Be on the look out in Fall 2015, as we apply for a Silver rating! 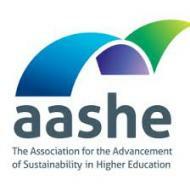 The easiest way to check our sustainability scores and to secure a BUNCH of resources is to create an AASHE membership. When you use your '@stmarys-ca.edu' address it is free! Does the word 'membership' scare you? Subscribe to the AASHE Bulletin, where you'll receive a weekly compilation of news, opportunities, new resources, job postings, and events related to sustainability in higher education. Additionally, you'll get new ideas on how we can implement more sustainability programs and features from other colleges and universities.